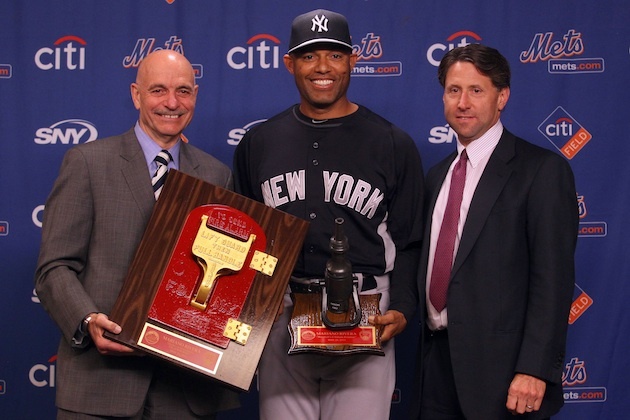 Before last night’s game against the Yankees, the Mets honored future Hall of Famer Mariano Rivera will some farewell gifts. Mets COO Jeff Wilpon along with NYFD Commissioner Sal Cassano presented Rivera with Fire Department Call Box and Fire Hose, both of which were mounted onto plaques. First off, I’m completely fine with gifts and tribute video’s for players of his caliber, Rivera is an all-time great and a prime example of what every ball player should strive to be in their careers. Now, I’m not exactly sure what other teams have been giving Rivera on this farewell tour, but those I’m sure those plaques didn’t exactly impress him. Those are items that will surely be placed up in his attic somewhere, if they even make it into his home at all. Just last year we said goodbye to long time nemesis Chipper Jones. I felt what the Mets gave him was very fitting. It was a painting of Shea Stadium decked out in Mets artwork with Chippers face planted on the scoreboard, as it would be any time he was due up against us. I thought that was a nice memento for a long time opponent, something representing the Mets while reinforcing the idea of him being a long time opponent, which is the way it should be. The gifts were one thing, but was it really necessary to have him throw out the first pitch? I found that to be a bit embarrassing. Rivera is a Yankee, not a Met. Honoring him was completely fine but there was no need to have a cross town rival for all of these years celebrated to that caliber in our own ball park. Rivera is not even retired yet, he is still on the Yankees and is an opponent in the game! Maybe I’m just old fashion and don’t like the fraternizing in today’s game but we don’t need to have a feeling of friendship with another current player who has never played for this franchise during the first pitch ceremony. Look, we all know the Mets season isn’t going anywhere, we understand where this team is currently at. But that doesn’t mean that we need our owner, who isn’t exactly in good graces with the fan base as is, declaring in May that our season is already over. It’s the little things like this that add fuel to the fire towards the Wilpon’s and could easily be avoided by the change of just a word or two. Ownership just doesn’t seem to get it. Maybe Jay Horowitz should start holding up cue cards before the Wilpon’s speak from now on.